Maybe you've never heard of ITI Airlines, but they are not new in the Philippines. 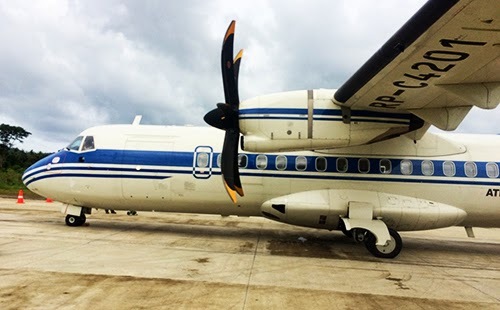 For many years now, they have operated as a one-route airline with 3 daily non-stop flights from Manila (the capital of the Philippines) to El Nido (a vacation paradise on the island of Palawan). The airline is reportedly owned by the same company that owns the infamous El Nido Resorts. Our staff recently had the opportunity to fly the airline, and based on our experience, we have deemed it the best and worst airline in the Philippines. #1 - Offers an exclusive route: It's the only airline offering a non-stop flight from Manila to El Nido. The only other option to get to El Nido is to take a flight from Manila or Cebu to Puerto Princessa, and then take a 5-6 hour shuttle ride to El Nido. #2 - Super quick: The flight, which again is non-stop, is only about 55 minutes long. #3 - Comfortable: The one aircraft they use is small, but not that small. It's a 50-seat ATR 42-500 propeller jet, and was actually a very comfortable ride. #4 - Nice terminals: The terminals used by this airline (in both Manila and El Nido) are first-class, and they offer free snacks and drinks before and after your flight. Even more, the restrooms have toilet paper (something you generally won't see in Philippine airports). #5 - Punctual: The airline seems to always be on-time. We only flew the airline twice (from Manila to El Nido, and back to Manila from El Nido), but both flights were punctual and we got the impression that this is a habit of the airline. #2 - Too hard to reserve a ticket: Reserving a ticket online is a hassle and takes forever. Again, as of July 2014, their web site does not offer you the ability to reserve or pay for a ticket online. If you want to buy a ticket, you have to email them, they will email you back asking you to answer a few questions, and then they will send you an online 3rd party payment link. After paying, then they will email you a confirmed reservation. #3 - Terrible customer service: Calling ITI Air is also a hassle. While in El Nido, we wanted to purchase one-way return tickets back to Manila, but we did not get an immediate response when we emailed them. So, we decided to call their local Manila number... also to no avail. The hotel we were staying at gave us a local El Nido number for the airline, which connected us to a woman on a cell phone (We couldn't believe it! ), who later texted us several times to complete our reservation. #4 - No brand, no personality: The airline has no brand. We were very shocked to see that, unlike all other airlines, ITI Air has no logo displayed on their web site or on their aircraft. This paints the picture of a very colorless company with no personality... and no business sense. #5 - Baggage inconsistencies: Finally, we think this is a terrible airline because of their inconsistencies in baggage weight. On our one-way trip from Manila to El Nido, the weight of our luggage was "just right" and we did not incur any extra charges. But on our return trip back to Manila from El Nido, we had to pay an extra 600 pesos because our luggage was "over the limit". Ironically, we did not purchase anything (no souvenirs, no t-shirts, no food, etc) while in El Nido and so our baggage weight would not have increased.